For more than a half-century, students across the United States have come to know mitochondria as the "powerhouse" of cells -- a label rooted in their ability to generate energy. Yet just as any worthwhile factories feature quality control centers, so too do mitochondria. With a new, nearly $1.4 million grant from the National Institutes of Health, University of Nebraska-Lincoln researchers are leading efforts to better understand Oma1 -- an enzyme critical in the maintenance of mitochondria that could prove key to combating ALS (amyotrophic lateral sclerosis) and other late-onset neurological diseases. As part of this intramitochondrial quality control system, Oma1 helps eliminate damaged or excess proteins in the same way an inspector might remove defective products from circulation on a factory floor. The UNL-led team aims to clarify the murky mechanisms behind the activation of Oma1, which previous research has suggested will lie dormant until it senses its cell is under siege by disease- or age-related stress. 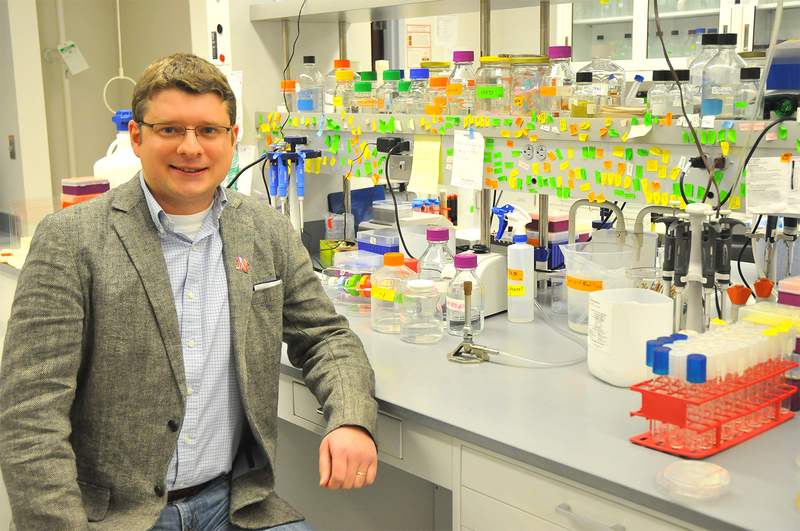 "The concept of an (enzyme) that sits in the membrane and gets activated by stress is pretty novel," said Oleh Khalimonchuk, assistant professor of biochemistry and faculty member in the Nebraska Center for Redox Biology, who heads the research team. "You ask yourself, 'Why in the world would nature preserve something over millions of years if it doesn't do anything?' We got intrigued by that, and we started to look at certain conditions where cells are under stress -- conditions that are mimicking a disease state. Lo and behold, Oma1 becomes important. "We don't know many more details than that, and we want to figure out how this works." To dig deeper into the processes underlying Oma1's response, Khalimonchuk and his colleagues are using analytic tools from genetics, cell biology and protein chemistry to analyze its behavior in yeast, mammalian cells and zebrafish. The team is also examining the genetic- and molecular-level interactions between Oma1 and the recently identified "partner proteins" it works with to maintain the healthy functioning of mitochondria. "In essence, this is a highly interconnected network," Khalimonchuk said. "That's where yeast becomes a really useful model, because you can easily delete genes there to functionally dissect the components of that system. It also helps us to screen for other molecules that might take over when these proteins are absent. So it should help us to define the quality control landscape of mitochondria." Khalimonchuk said recent studies have connected mutations in Oma1 with incidence of ALS, commonly known as Lou Gehrig's disease. He said about 90 percent of ALS cases are not currently tied to a specific cause, potentially making Oma1 research a revelatory weapon in the fight against an affliction that is without a cure. "This is an exciting development, because we have essentially identified a novel genetic factor that potentially predisposes people to ALS," Khalimonchuk said. "We have data (showing) that cells that are deficient in Oma1 … cannot respire properly, meaning that even when it's necessary to slow down a little bit, they won't do that. When the cells age, this actually leads to progressive respiratory decline. We believe that this is actually one of the reasons for ALS, because ALS is a late-onset disease." If future research efforts can identify ways to stimulate Oma1 in such cases, Khalimonchuk said, they could enable therapeutic interventions capable of combating the neurodegenerative disease. "We are witnessing a renaissance of mitochondrial research," Khalimonchuk said. "People are understanding that many of these diseases that are seemingly incurable may have mitochondrial dysfunction behind them." The team's research is funded by the National Institute of General Medical Sciences, part of the National Institutes of Health, under grant No. R01GM108975.